While eating the pieces of Bob’s leg, Gareth discusses his sense of reality while looking out the window at the walkers. He admits that he and his group made the markings throughout the woods, with an ability to get back to their camp if needed. He starts to walk through his preferences in eating men versus women, particularly interested in eventually eating Carol or Sasha. Bob’s cries eventually start to turn more into laughter, after he reveals that he has actually been bitten, saying that he is “tainted meat.” Gareth’s group freaks out while Bob screams “tainted meat” at the top of his lungs, eventually getting knocked out once Gareth has enough. Sasha ventures out to look for Bob when she gets attacked by a walker. She dispatches it and reconnects with Rick and Tyreese. Inside, the rest of the groups awaits their return. Sasha walks back in and directly up to Gabriel. She begins to blame him for the chaos that has befallen their group. Claiming to be innocent of the accusations, he continues to get berated by Sasha and then questioned by Rick. Gabriel finally starts to break down and admits that he locked the doors at night. Groups of people had been trying to get into the building and attracted the walkers. He kept the building locked down, refusing to let them in. He heard the screams of his flock damning him for his failure to save them. He buried the remains. Getting down on his knees, he says that Rick’s arrival is his punishment. Suddenly, they spot a person laying in the grass and run out to investigate. Discovering that it is Bob, they scoop him up, take out some of the walkers around the church, and then hurry back inside. Behind Rick, an “A” has been marked on the side of the building. Bob recounts his whereabouts and the loss of his leg at some school nearby. Clearly in pain, he refuses to take any medicine. He pulls down his shirt to reveal his shoulder bite. Gabriel offers to let Bob lay down on the couch in his office and recounts his knowledge of the school. Abraham jumps in and demands that they leave immediately. Rick refuses, wanting to wait for Daryl and Carol to return. The argument comes to a head when Glenn jumps in and demands that they need each other to survive and get to DC. They continue to bargain but cannot reach an agreement. 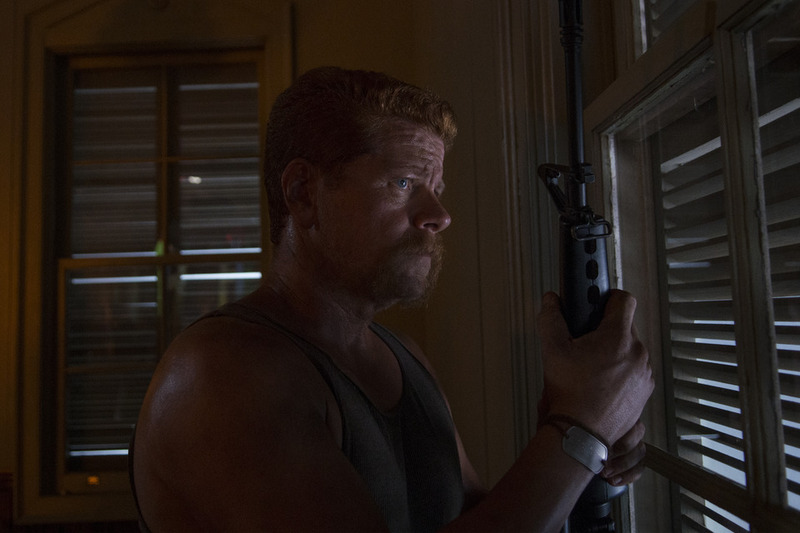 Abraham begins to gather his stuff together when Glenn jumps in and gets him to agree to at least help with their revenge on Gareth’s group. Tending toe Bob on his death bed, Sasha listens to his mumbling and game playing, struggling to humor him. Bob admits that he kept it a secret because he did not want to think about the end. Rick gets the group back to talking about their revenge plan. Sasha demands to join the group on their mission. Tyreese follows Sasha back to the room with Bob, stating that she should reconsider staying with Bob. He recounts his loss back at the prison, to which Sasha questions his logic and his sense of forgiveness. She takes out her knife, gives it to Tyreese, and demands that he finishes Bob if he awakens turned. She rejoins the rest of the group and heads up in the dark to complete their mission. Having been hiding in the shadows, Gareth and his group emerges and walks toward the church. They break into the front door, while Gareth announces his intentions to draw them out. He lists the people he knows happen to be in the building, having seen Rick and rest walk out the door. With Gareth’s men set up at the two doors ready to strike, Judith no longer is able to stay quiet and alerts Gareth to where she is. Suddenly shots are fired from the shadows, taking out two of Gareth’s men and putting Gareth on the floor with his hand blown off. Abraham comes from the side to hold them at bay. Gareth starts to try to justify his behavior with only mentions of the past. He claims that they can walk away, but Rick just pulls out the red-handled machete and the group finishes what was left of Gareth’s army. Among the dead bodies, Michonne rediscovers her katana. The rest of the group begins to emerge from the rooms to see the carnage. Gabriel stands in bewilderment while Maggie dismisses the building’s sanctity. The next morning, the group gathers at Bob’s bedside to say their goodbyes. Bob asks Rick to stay behind to thank him. He reminds Rick that he is one of the few good people left in the world. He reminds Rick that nightmares should not end the man he truly is. A little while later, Sasha has replaced Rick at Bob’s side. She gives him a little smile, when he suddenly falls back out of consciousness. She draws her knife and prepares for the worst. Tyreese walks in and asks for her knife to take care of it for her. Letting Sasha leave the room first, he stands before Bob and only hesitates for a moment before preventing his inevitable turning. Afterwards, Sasha prepares his grave while Abraham gives his plans for his departure to DC. Glenn and Maggie, having agreed to the deal, get on the bus with Abraham’s group, leaving behind Rick, Michonne, Tyreese, Sasha, Carl, Judith, and Gabriel to wait for Daryl and Carol to return. Rick heads over to Tyreese, who is in the midst of digging graves, and asks about his travel to Terminus. Tyreese says that it killed him, but Rick reminds him that he is still alive. That night, Gabriel joins Michonne out on the front steps for a moment alone. After chatting for a moment, Michonne hears a noise from the woods and discovers Daryl alone. She questions where Carol is, but whoever is in the woods stays in the shadows as the episode comes to a close. Reaction: Cannibals no more. Gareth and his group finally reached their end in a very similar way to the story from comics. There was not much more that could be done with Gareth, as he was really too far gone to be redeemed and seemed to have fallen into a very strict pattern of eat the living to stay alive. It was enjoyable and satisfying, but there was much more to this episode than the death of the cannibals. Rick and Abraham officially have a love-hate relationship going with their views about getting to DC. While Rick agreed to do it eventually, he is trapped with his determination to keep the group together. Abraham, on the other hand, is determined to get there as fast as possible. While Eugene seemed to be a little apprehensive for a moment, he only does what Abraham says. They would have probably actually come to blows if Glenn had not stepped in and offered a compromise. His sacrifice prevented a possible rift from really going bad. The little piece at the end that somewhat mended their issues for the moment was the note on the map. Abraham passed along a small message to convince Rick that he really would like to continue their partnership in the future in DC. It was sad to see Glenn and Maggie split from Rick’s group again, but they will likely reconnect not too far down the road, with likely only a maximum of two or three storylines diverging before coming back together. Bob’s departure was inevitable, but it was a little more meaningful than the end of Gareth. 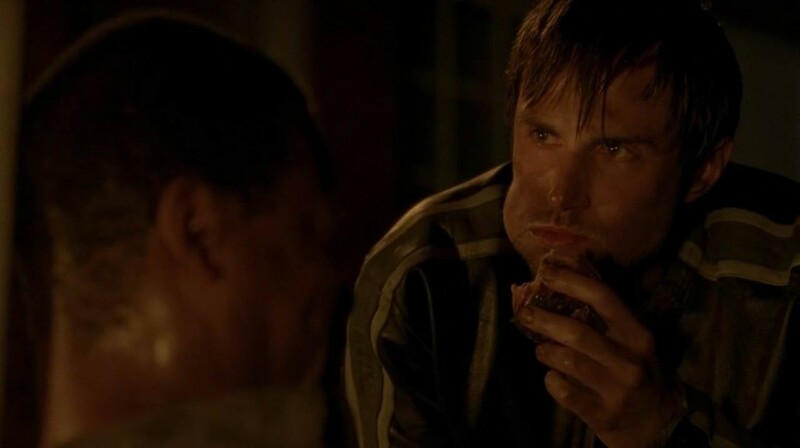 He got a moment of revenge when he explained to the Termites that he was tainted meat, confirming that he had been bitten in the previous episode. He also had some explaining to do when he was returned to the church, a little more worse for wear. He had kept his injury from the group, but he actually had a somewhat admirable reason. While the rest of the group had come to terms with killing when it was needed, he was still under the view that he needed to somehow retain his sense of self and be able to have that untainted version make it out of the nightmare. He reminded Rick and Sasha of their humanity when they both were so focused on revenge and action. His story was also a moment for the more gentler Tyreese to still have a role in the group, taking the knife from Sasha to finish Bob before he turned. Gabriel’s story was revealed, though it was a little too easy to guess from the previous episode’s clues. Rick should have been able to figure it out from the message on the back of the church, but it only took a little more aggression to get him to break down. Having turned people away, he felt like he had failed his faith by refusing to save his flock. His story still has something left to be desired in comparison to the intensity of the survival of Rick’s group or the return of Carol, Daryl, and Beth. Next week appears to be a Beth-focused episode, which will finally give some closure to what happened to her and, hopefully, whether Carol survived the trip as well.